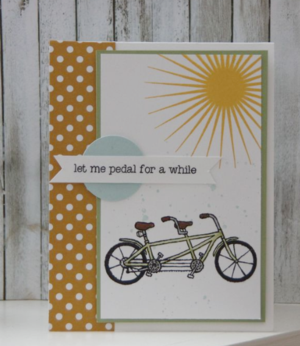 I had a giggle a little at the title of this set…Pedal Pusher. I like the pun that's intended here. 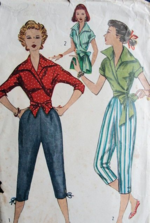 Pedal Pusher could be technically someone pushing the pedals or those pants, Pedal Pushers, popular in the 50's and beyond. It's a cute little pun and I'm sure it was intended….of course, where I got my giggles was when I said it out loud the other day and I had an image of a Petal Pusher…like in "pushing up daisies. I'll refrain from sharing the a daisy/cemetery photo. Some things you just can't "unsee"
I'm not sure why that struck me so funny but now I can't get the image out of my head…so yes, you are welcome because you won't either. My morbid humor is ruining it for you? I'm glad the set is so stinkin' cute and a little corny entendre won't do untold damage to it. This really is an adorable set…You would love it. Get it now while supplies last…place a qualifying order of $50 and this set can be YOURS.